See that brilliant yellow glow right over the sun painted on the temple? That's the sunset on Winter Solstice. I found this photo that we had taken on the Winter Solstice. 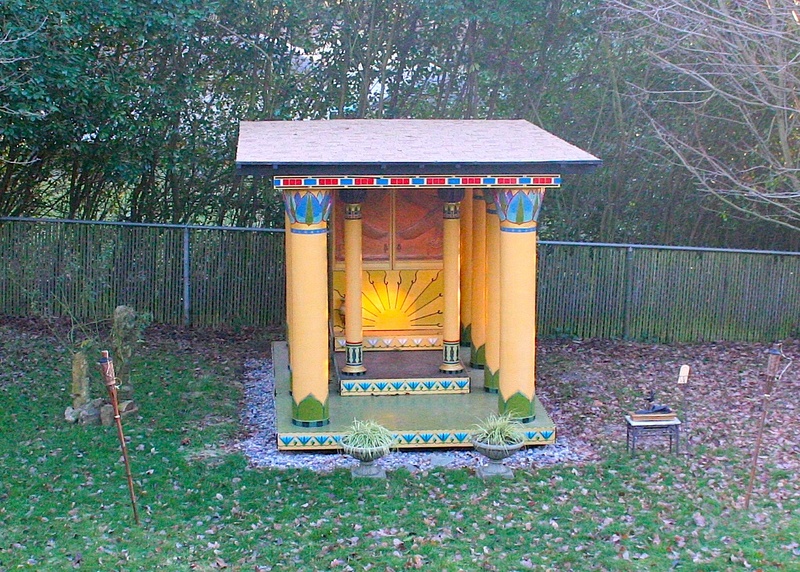 All unplanned, the solstice sunset shines exactly on the sun image painted on the lower altar of the Isis temple in my backyard. In case you didn’t know, this is the main part of the Temple of Isis that was built for last year’s SunFest. Lucky priestess that I am, I inherited it (though not the whole temple—just too big!) in my backyard. This is the first Oregon winter the temple has experienced. So far, it’s holding up well. Previous Previous post: What’s to Become of Isiopolis? Next Next post: When does Sirius, the Star of Isis, rise in your area?